Todays post a little different from the norm. This month (March) is Autoimmune Disease Awareness Month and in support of it I will be speaking briefly about an autoimmune disease known as Raynaud’s. Unless you suffer with it or have a family member or friend that has this illness, you have probably never heard of it. 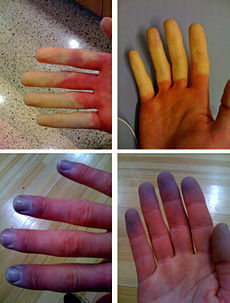 Basically, Raynauds is a condition that causes certain ares of the body, for example, fingers, toes, nose and ears to feel numb because of lack blood flow to the affected area or areas and this is in response to cold temperatures often times but on rare occasions emotional stress can bring on the attack. As the affected begins to “warm up” and the blood starts flowing to the affected area, the color of the skin begins to change color again, from white, to red to sometimes blue. Yes this is painful, it throbs and sometimes tingles. Raynaud’s normally accompanies other autoimmune diseases but not all the time, sometimes it just occurs by itself. Not a lot is known about this condition and there is no cure. However, my goal is to make others aware of it. If you would like more information on Raynaud’s please stop by the Raynaud’s Association website as well the Facebook Page for more helpful tips and support if you are dealing with this. They also have a shop on the website with some helpful products that will help keep you warm.